Scientists at Sainsbury Laboratory Cambridge University have found that the mineral vaterite, a form (polymorph) of calcium carbonate, is a dominant component of the protective silvery-white crust that forms on the leaves of a number of alpine plants, which are part of the Garden's national collection of European Saxifraga species. Naturally occurring vaterite is rarely found on Earth. Small amounts of vaterite crystals have been found in some sea and freshwater crustaceans, bird eggs, the inner ears of salmon, meteorites and rocks. This is the first time that the rare and unstable mineral has been found in such a large quantity and the first time it has been found to be associated with plants. The discovery was made through a University of Cambridge collaboration between the Sainsbury Laboratory Cambridge University microscopy facility and Cambridge University Botanic Garden, as part of an ongoing research project that is probing the inner workings of plants in the Garden using new microscopy technologies. The research findings have been published in the latest edition of Flora. The laboratory's Microscopy Core Facility Manager, Dr Raymond Wightman, said vaterite was of interest to the pharmaceutical industry: "Biochemists are working to synthetically manufacture vaterite as it has potential for use in drug delivery, but it is not easy to make. Vaterite has special properties that make it a potentially superior carrier for medications due to its high loading capacity, high uptake by cells and its solubility properties that enable it to deliver a sustained and targeted release of therapeutic medicines to patients. For instance, vaterite nanoparticles loaded with anti-cancer drugs appear to offload the drug slowly only at sites of cancers and therefore limit the negative side-effects of the drug." Other potential uses of vaterite include improving the cements used in orthopaedic surgery and as an industrial application improving the quality of papers for inkjet printing by reducing the lateral spread of ink. Dr Wightman said vaterite was often associated with outer space and had been detected in planetary objects in the Solar System and meteorites: "Vaterite is not very stable in the Earth's humid atmosphere as it often reverts to more common forms of calcium carbonate, such as calcite. This makes it even more remarkable that we have found vaterite in such large quantities on the surface of plant leaves." Botanic Garden Alpine and Woodland Supervisor, Paul Aston, and colleague Simon Wallis, are pioneering studies into the cellular-level structures of these alpine plants with Dr Wightman. Mr Wallis, who is also Chairman of the international Saxifrage Society, said: "We started by sampling as wide a range of saxifrage species as possible from our collection. The microscope analysis of the plant material came up with the exciting discovery that some plants were exuding vaterite from "chalk glands" (hydathodes) on the margins of their leaves. We then noticed a pattern emerging. The plants producing vaterite were from the section of Saxifraga called Porphyrion. Further to this, it appears that although many species in this section produced vaterite along with calcite, there was at least one species, Saxifraga sempervivum, that was producing pure vaterite." Dr Wightman said two new pieces of equipment at the microscopy facility were being used to reveal the inner workings of the plants and uncovering cellular structures never before described: "Our cryo-scanning electron microscope allows us to view, in great detail, cells and plant tissues in their "native" fully hydrated state by freezing samples quickly and maintaining cold under a vacuum for electron microscopy. We are also using a Raman microscope to identify and map molecules. In this case, the microscope not only identified signatures corresponding to calcium carbonate as forming the crust, but was also able to differentiate between the calcite and vaterite forms when it was present as a mixture while still attached to the leaf surface." So why do these species produce a calcium carbonate crystal crust and why are some crusts calcite and others vaterite? The Cambridge University Botanic Garden team is hoping to answer this question through further analysis of the leaf anatomy of the Saxifraga group. They suspect that vaterite may be present on more plant species, but that the unstable mineral is being converted to calcite when exposed to wind and rain. This may also be the reason why some plants have both vaterite and calcite present at the same time. The microscopy research has also turned up some novel cell structures. 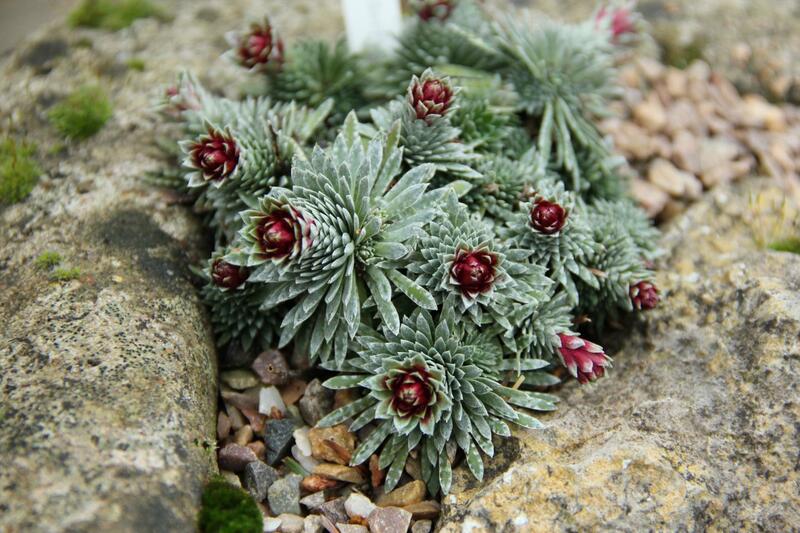 Mr Aston added: "As well as producing vaterite, Saxifraga scardica has a special tissue surrounding the leaf edge that appears to deflect light from the edge into the leaf. The cells appear to be producing novel cell wall structures to achieve this deflection. This may be to help the plant to collect more light, particularly if it is growing in partly shaded environments." The team believes the novel cell wall structures of Saxifrages could one day help inform the manufacture of new bio-inspired optical devices and photonic structures for industry such as communication cables and fibre optics. Mr Aston said these initial discoveries were just the start: "We expect that there may be other plants that also produce vaterite and have special leaf anatomies that have evolved in harsh environments like alpine regions. The next species we will be looking to study is Saxifraga lolaensis, which has super tiny leaves with an organisation of cell types not seen in a leaf before, and which we think will reveal more fascinating secrets about the complexity of plants." There is a risk that some of these tiny but amazing alpine plants could potentially disappear due to climate change, damage from alpine recreation sports and over-collecting. There is still much to learn about these plants, but the collaborative work of the Sainsbury Laboratory and Cambridge University Botanic Garden team is revealing fascinating insights into leaf anatomy and biochemistry as well as demonstrating the potential for Saxifrages to supply a new range of biomaterials.